In California, Orange County is known for its sun-drenched beaches, impressive golf courses and upscale living. But the area also boasts distinctive shopping centers, fantastic restaurants, diverse entertainment venues and beautiful active adult communities. Orange County is an ideal destination for active adults looking for an exciting vacation or a sunny retirement location. California generally enjoys a Mediterranean climate with warm, dry summers and wet, mild winters. In Orange County, the weather is perfect for outdoor activities year-round. The hot summer days are cooled by ocean breezes and the cool winters are warmed by sunny skies. With such a temperate climate and its proximity to the Pacific Coast, Orange County boasts many beautiful beaches. Each stretch of shoreline has its own distinct allure. 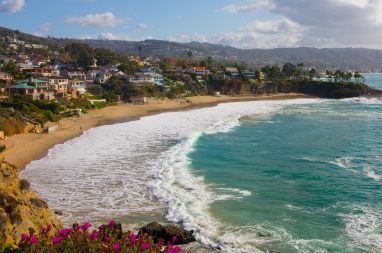 Laguna Beach is a premier seaside destination which is popular with tourists all year long. Huntington Beach and Sunset Beach are both prime spots for surfing, swimming or walking along the shore. And those who want the most spectacular ocean views often opt for a trip to Dana Point or Newport Beach. Orange County's beautiful year-round weather is also the perfect setting for golf enthusiasts. Spectacular courses offer challenging play for golfers of any skill level. There are golf clubs which feature amazing ocean views, tranquil countryside settings or lush mountain vistas. With so many impressive courses to choose from, O.C. golfers will never be bored. Two must-play courses are Strawberry Farms Golf Club in Irvine, and San Juan Hills Golf Club in San Juan Capistrano. Of course Orange County has much more to offer than beautiful beaches and spectacular golf courses. Shopping, dining and a variety of entertainment venues are found throughout Orange County. There are theme parks, historic sites and cultural attractions. From the luxury offerings at Fashion Island in Newport Beach to the casual atmosphere of Anaheim GardenWalk, there is something for everyone in Ocean County. Active adults who choose to relocate to Orange County can find beautiful homes in several different age-restricted communities. Laguna Woods Village, in Laguna Woods, is a sprawling community with over 12,000 residences, seven clubhouses, 36-holes of golf and numerous resort-style amenities. Single-family homes, attached homes and condos give homebuyers options in a variety of sizes, styles and price ranges. In Mission Viejo, active adults will find two beautiful age-restricted communities: Casta Del Sol and Palmia. Each community offers its own resort-style amenities through their well-appointed clubhouses. As the larger of the two, Casta Del Sol offers 1,920 single-family homes in a picturesque setting. Palmia, with 900 residences, includes both single-family homes and attached villas. Orange County certainly has a lot to offer visitors and residents of all ages. For active adults who crave summer all year long, it may be just the place for an idyllic retirement.